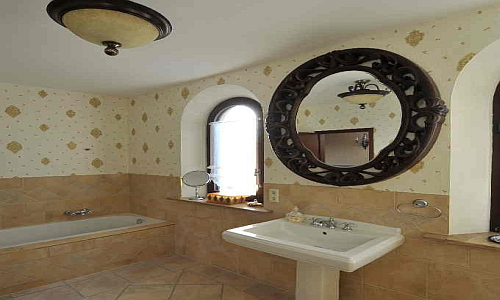 In 2011 we extended our hotel with the "Castle Romantic" **** for sophisticated visitors. 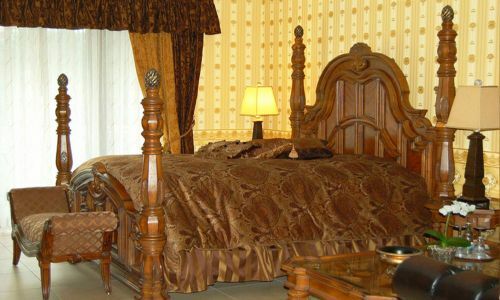 It is no knight`s castle, it is a castle to rest and relax in a romantic and extraordinary atmoshere. Our "Castle romantic" is located in the middle of our 5000 m ² property in a quiete area and overlooks the conservation area Seeberg. It is located netxt to the Landhaus Romantik. 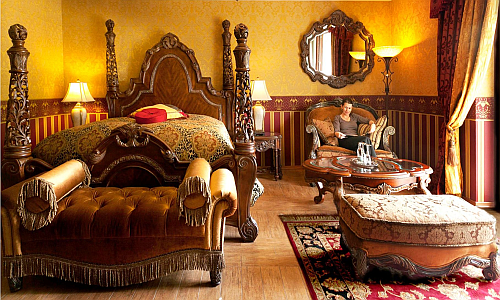 In our extraordinary Castle Romantik you will experience 4 star comfort and an atmosphere you feel at home. 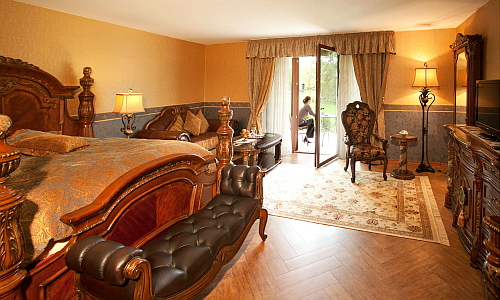 Here we can offer you 10 spacious castle rooms (apr. 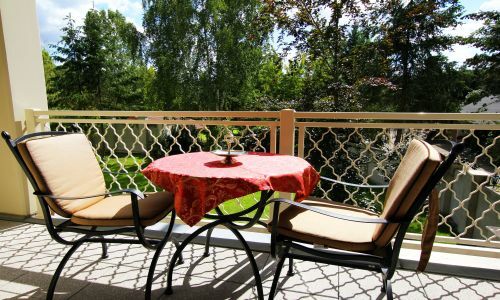 35 m ² to 100 m ²) with terrace or balcony. 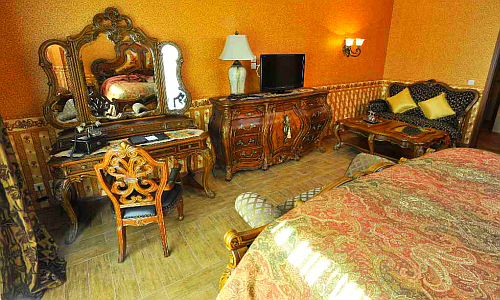 Our castle rooms will enchant you with magnificent beds and furniture in the traditional design of Michael Amini. Enjoy the stylish interior of our beautifully decorated rooms that fits perfectly with the Moorish architecture and emphasizes the distinctive castle character of the hotel. 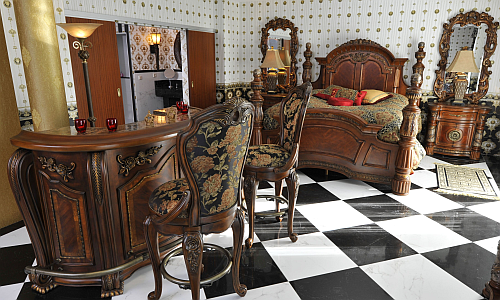 Our differently themed, feelgood hotel rooms will enchant you. You can relax at a living space of approx. 100m² in our majestic castle suite in a style of Villa Valenica. The vibrant and romantic lifestyles of the Spanish coast impress this castle room with great attention to detail through lighted alabaster-like encasement, providing a soothing and ambient glow. 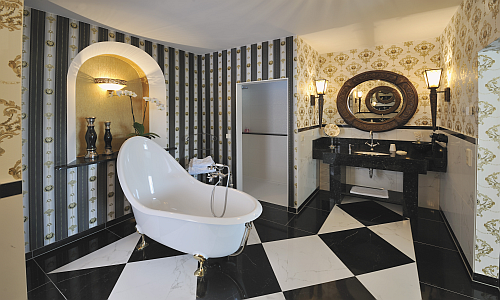 A generous sitting area and an exclusive bathtub will make it to an exquisite atmosphere. The Castle suite is equipped with a huge terrace with a magnificent view to the conversation area Seeberg and the city Gotha. It has a cozy seating area, a separate writing desk, flat-screen TV, radio, telephone, internet access, a generous terrace as well as a top quality bathroom with shower, separate toilette, 2 washbasin, hairdryer and a bathtub. 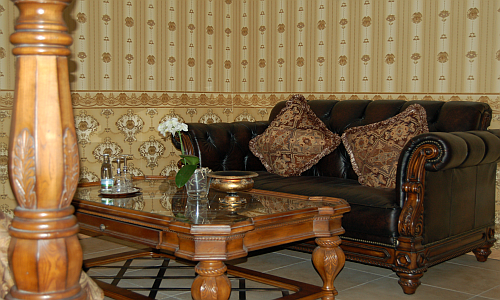 Our room rates include free use of the parking spaces on the hotel premises. On demand you can book our wellness package with free access to the sauna area. 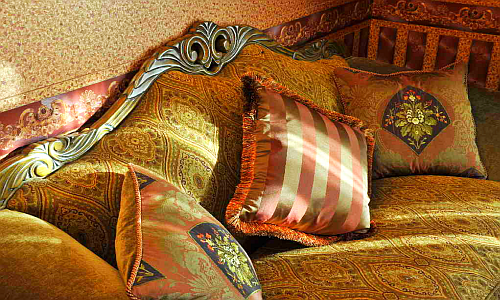 Our castle rooms deluxe will enchant with magnificent beds and furniture in the traditional design of Michael Amini. Our furniture features great attention to detail which can be seen in intricate metal designs, dramatic intricate carvings and marble at the top of the furniture’s. 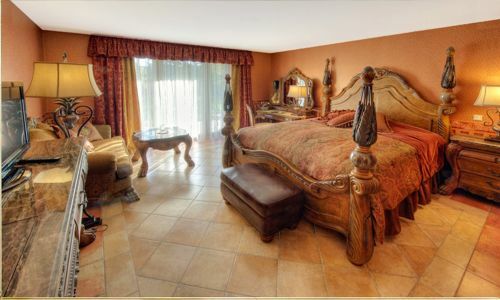 Each room has its own attraction and will catch you with romantic beauty and charm. 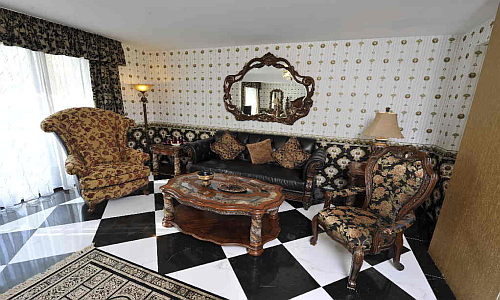 Castle rooms deluxe facing the garden have a living space of approx. 46 m². 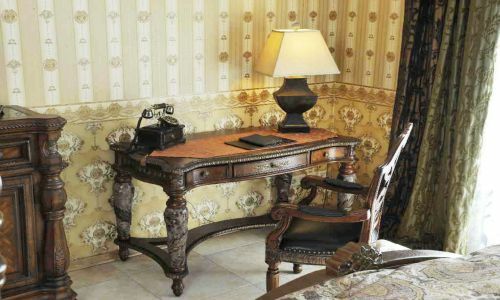 The rooms are equipped with lordly wallpaper and decorated in warm and harmonic colors. They have a cozy seating area, a separate writing desk, flat-screen TV, radio, telephone, internet access, a generous terrace as well as a top quality bathroom with shower, separate toilette as well as a hairdryer and partly additional with bathtub and bidet. The look and feel of Old World Spain have been beautifully captured in this grand collection.Villa Valencia draws its inspirations from the city of Valencia, in Spain. The name itself comes from the Latin name of the city, Valentia, which means "strength," and "vigor." Uniquely twisted and shaped marble pilasters with carved wooden leaves wrapping around adorn some of the pieces. Inspired through Spanish, Italian and Moorish origions our Oppulente Castle room will impress with its ornate metalwork, exquisite marble inlays and intricate carvings and will bring home feelings of tranquility and affluence. 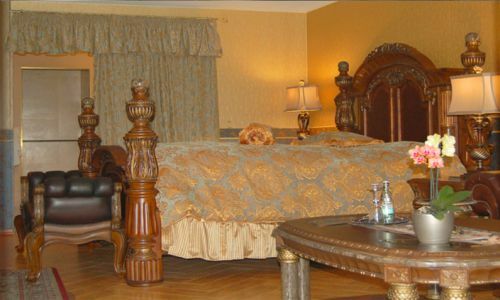 Our castle rooms will enchant with magnificent beds and furniture in the traditional design of Michael Amini. 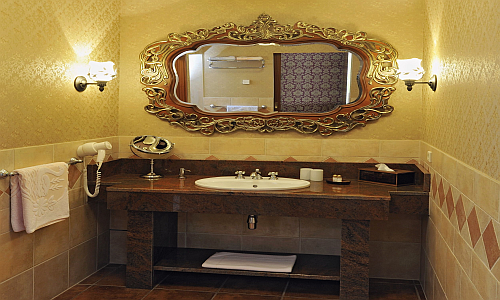 Our furniture features great attention to detail which can be seen in intricate metal designs, dramatic intricate carvings and marble at the top of the furniture’s. 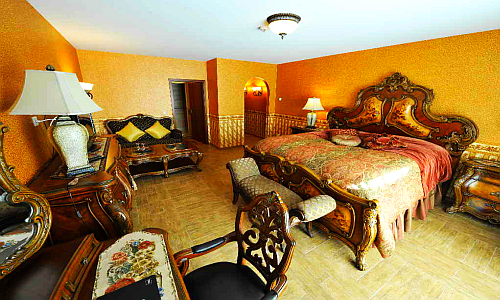 Each room has its own attraction and will catch you with romantic beauty and charm. 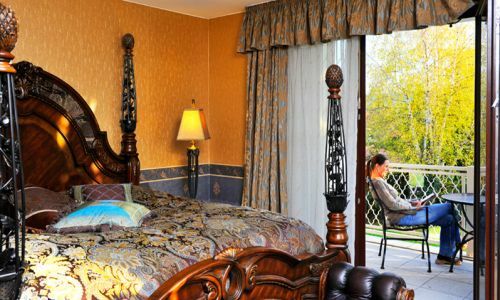 Our castle rooms have a view to the garden and have approx. 34 m² - 39 m² living space. 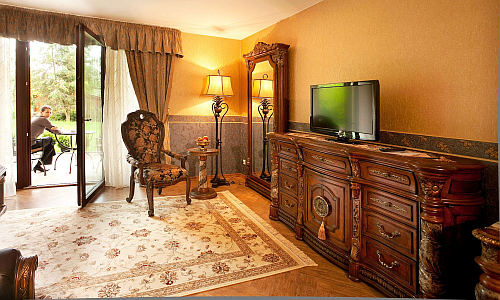 The rooms are equipped with lordly wallpaper and decorated in warm and harmonic colors. They have a cozy seating area, a separate writing desk, flat-screen TV, telephone, internet access, a generous terrace as well as a top quality bathroom with shower, separate toilette as well as a hairdryer. 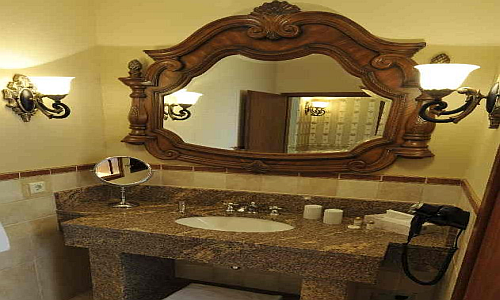 Palais Royale exudes an air of elegance, grandeur and a certain savoir-faire. The Palais Royale Collection is reminiscent of the elaborate detailing of the classic French Rococo styling with its intricate veneer work, undulating curves and exuberant floral embellishments. The magnificent panel bed boasts a unique pillowed wood design that beckons a closer look, while case goods feature bombe curvature. 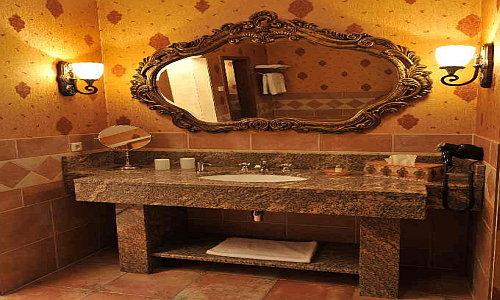 Scaled and proportioned to suit any home with impressive elegance. 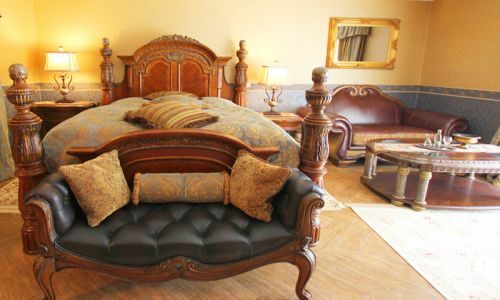 Influences of Spain and the northwestern Mediterranean, with their lively style and zest for life, are abundant in the Vizcaya Collection.Decorated with wood hand carvings,and topped with metal finials, the regal posterbed invites anyone to lose themselves in the feelings of the swashbuckling lore. 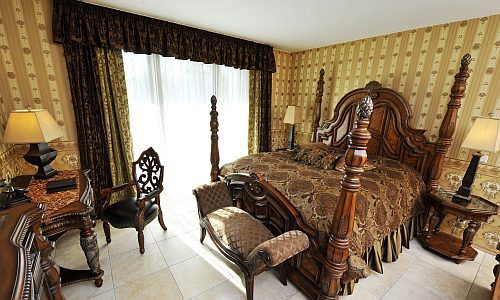 Eden brings the flair of European "Old World" styling, and ties it all together by featuring a Lion's paw motif.Dramatic intricate carvings are found throughout the collection, as marble compliments the tops of the bedside chests and large dressers, while curved beveled glass adds to the beauty and charm. 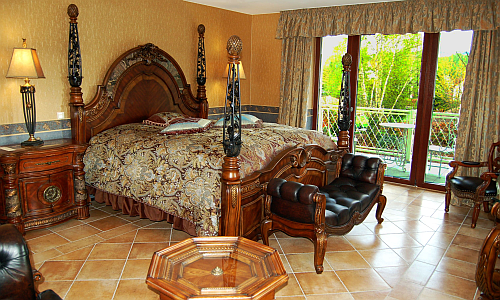 All castle rooms are double rooms and available for single use.